The National Committee of the Chinese People's Political Consultative Conference (CPPCC), the country's top political advisory body, convened its annual session in Beijing Sunday. 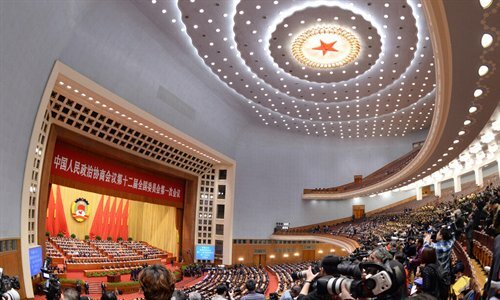 About 2,200 members of the 12th CPPCC National Committee from different sectors across the country will discuss major issues concerning the country's development during the session, scheduled to conclude on March 12. New leaders of the top advisory body will also be elected at the session. At the opening meeting in the Great Hall of the People, CPPCC National Committee Chairman Jia Qinglin delivered a report on the work of the committee's Standing Committee over the past five years. Jia said China has overcome "severe challenges" and made "extraordinary achievements" in reform, opening up and socialist modernization. The CPPCC fully played its role in coordinating relations, pooling strengths, making suggestions and proposals to the central leadership, and serving the overall interests of the country, Jia said. Over the past five years, a total of 28,930 proposals had been submitted by the CPPCC National Committee members, and 26,583 of them had been handled as of February 20, according to Wan Gang, vice chairman of the 11th CPPCC National Committee. Jia said the CPPCC has made important contributions to the country's development in various fields such as scientific development, social stability, China's reunification and foreign exchanges. He said the CPPCC, always focusing on the central task of economic development, made a large number of high-quality comments and suggestions on issues pertaining to economic and social development. It also actively participated in social development and management and gave impetus to cultural reform and development, Jia said. Jia highly praised the achievements made by the CPPCC, saying the political advisory body had "written a new chapter in its history". In regards to its future work, Jia said the CPPCC should better play its role as an important channel for promoting consultative democracy by enriching the forms of consultation and improving the consultative system. "We should actively assist the Party and government in the work of getting the people to voice their demands, coordinating their interests, and safeguarding their rights and interests," Jia said in his report. Jia said the CPPCC must "firmly stay focused on the themes of unity and democracy" to consolidate social harmony and vitality. "Unity and democracy are the historical foundation of the creation and development of the CPPCC," Jia said, adding that they constitute the hallmark of the political advisory body. An editorial published Sunday by the People's Daily, the flagship newspaper of the Communist Party of China (CPC), said the ruling Party should tolerate different opinions or even sharp criticism. Meanwhile, all democratic parties and CPPCC members should tell the truth, give forthright admonition and good suggestions to the Party, and be its outspoken and loyal friends, said the editorial. "Unity produces strength, and democracy creates vitality," Jia said, noting that unity and democracy need to be incorporated into the work of the CPPCC. In his speech, Jia said the political advisory body should maintain close contact with CPPCC National Committee members from Hong Kong and Macao to get them to play positive roles in building their special administrative regions. Exchanges and cooperation with Taiwan should be enhanced to cultivate more common interests for peaceful growth of cross-Strait relations, Jia said. He also noted that the CPPCC should help deepen China's relations with other countries through new channels and high-level visits. Top Party and state leaders Hu Jintao, Xi Jinping, Wu Bangguo, Wen Jiabao, Li Keqiang, Zhang Dejiang, Yu Zhengsheng, Liu Yunshan, Wang Qishan and Zhang Gaoli attended the opening meeting. Founded in 1949, the CPPCC consists of elite figures of the Chinese society who are willing to serve the think tank for the government and for the country's legislative and judicial organs. As an open forum where the ruling CPC, non-Communist parties and people without party affiliation discuss state affairs freely and on an equal footing, the CPPCC has been the manifestation of China's socialist democracy.